Bill Kennedy placed second in France’s Chateau-Thierry-to-Paris relay race, in 1919. Photo courtesy of the National Library of France. When I was a kid, my Dad would take me to Heartbreak Hill, rain or shine, to watch the Boston Marathon. For our family, the race held special meaning, because our “Uncle Bill”—William J. Kennedy, my paternal grandfather’s uncle—had won the event in 1917. Though he had been dead for eight years by the time I was born, we still cherished the legend of “Bricklayer Bill,” as he was known. The Kennedys had plied the mason’s trade since at least the 1840s, when the first of us landed on these shores, during Ireland’s Great Famine. And according to the family lore, Bill, then an itinerant worker, rode the rails to Boston and slept on a pool table the night before the race. He triumphed in the marathon while wearing a homemade Stars-and-Stripes bandana and enlisted in the Army not long after his victory. The story was that pride in the United States spurred Bill to beat the favored Finnish runners, lest the world see the Yanks as weaklings as they entered the Great War. But there was more to my uncle’s triumph than national pride. Bill, it turned out, held a rich and sweeping definition of Americanness that embraced all creeds and colors, and his feat helped convince the country that Irishmen could be loyal Americans. Sometimes, I think his victory could have been the moment when Irish Americans lost their hyphen. My father Larry—a historian—and I started digging into Bill’s story after a seafood dinner with our cousin Ann Louise McLaughlin, who had started working at the Harvard University Press in the 1960s, and had received a manuscript of Uncle Bill’s memoirs, written late in life. We were amazed to hear this, but didn’t do anything about it at first—Ann Louise hadn’t exactly promised to hand the papers over. My wife and I often drove to Ann Louise’s house to plant tomatoes in her garden, or to lug laundry baskets up and down her stairs. Eventually, perhaps when she’d felt we’d done enough chores, she handed us Bill’s manuscript. It had been sitting in a box in her cellar for almost five decades. Using Bill’s typewritten recollections as a starting point, Dad and I pieced together his story, which went far beyond the shorthand legend we’d always heard. Born in New York City, Bill struck out on his own at the turn of the century, when he was 17 or 18. He spent years kicking around the country—from the Great Lakes to the West Coast to the Gulf Coast and back to the Northeast—riding the rails, following bricklaying jobs, and his passion: amateur competitive running. Bill running, May 1913, in St. Louis. Photo courtesy of the Kennedy Family Collection. When we started our research, we had no idea that Bill had won marathons in St. Louis, Chicago, and Long Island, New York. That Chicago race took place during a heat wave that killed several people, caused many of the 18 runners who entered to drop out, and forced organizers to cut the race short at 22 miles. But Bill chose to continue running until he’d completed the full distance of 26 miles, 385 yards. In Arkansas, he once beat a horse in a 10-mile race. We also found contemporary newspaper accounts of Bill’s fall from the roof of the Des Moines Coliseum, a tumble from a moving train, and other mishaps. 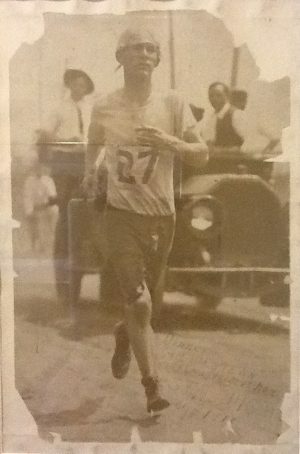 Bill was even hit by a motorcar during a marathon in St. Louis in 1910 or ’11, and again in a shorter road race in New York City in 1922. Courses were not blocked off then. Growing up in Harlem and Port Chester, New York, in the 1880s and ’90s, Bill almost certainly would have followed the Irish-American Athletic Club, whose amateur runners, jumpers, and hammer throwers were wildly popular in Irish neighborhoods. Fans collected cigarette trading cards with images of IAAC stars—many of whom had won Olympic medals—and filled the seats for track-and-field events and Gaelic football and hurling matches at Celtic Park, the club’s stadium in Queens. Bill joined the IAAC when he returned to New York in 1916, after his two marathon wins in the Midwest. It was a tumultuous time for the club: A still-neutral United States was leaning toward backing Britain as World War I raged in Europe—but the Irish in America were loath to take the side of their old foe. Many joined organizations like Clan na Gael to support the cause of independence for their ancestral homeland, and wanted the United States to have no part in the war. If anything, many Irish Americans were rooting for the Kaiser, just to stick it to the English. This undercurrent of rebellion ran through the IAAC. The group’s nickname, the Winged Fist, came from its logo, a raised, winged fist similar to the black power salute of later decades. Track meets and hurling matches at Celtic Park raised thousands of dollars for the Irish nationalist cause. The brother of IAAC star and Olympic shot put medalist Martin Sheridan was married to a sister of Michael Collins, the famous Irish revolutionary. New York Justice Daniel F. Cohalan, an active member of the club’s board of directors, was the in-house counsel for Clan na Gael, which like many independence groups, wanted an alliance with Germany and worked with German Americans to lobby for neutrality. These were the “hyphenated Americans” that President Woodrow Wilson and former President Theodore Roosevelt attacked with special scorn in speeches at the time. So it struck Dad and I as a marvel that just a year later, with the United States officially at war with Germany, Bill was running—and winning—the marathon wearing the Stars and Stripes. By 1918, he and his two brothers were serving with the Army in France, along with tens of thousands of other Irish Americans. How had their opposition to the war evaporated so quickly? For one thing, Wilson had sold the war as a fight to protect small nations like Roman Catholic Belgium from imperialist powers like Germany—perhaps something that struck a chord among Irish Catholics. Secondly, the church hierarchy was eager to show that its flock was not a pack of rebellious Romans with divided loyalties, and that “hyphenated Americans” didn’t deserve the treatment that German Americans were suddenly subjected to—tarring and featherings, beatings, and (in one case) lynching. But there were less calculated reasons for Bill and his kind to join fellow Americans in the war effort, too. Irish Americans were genuinely grateful for the opportunities the New World had provided—and proud of their American accomplishments. They figured they had built half the nation’s railroads, for example, and the bravery of the “fighting 69th” and other Irish regiments in the American Civil War was legendary. Bill … held a rich and sweeping definition of Americanness that embraced all creeds and colors, and his feat helped convince the country that Irishmen could be loyal Americans. Bricklayer Bill also embraced America’s diversity. Returning to Port Chester after the war, he encouraged Italian friends to pursue citizenship, and he fought for their right to join his bricklayers’ union local. In 1925, he co-founded the Cygnet Athletic Club and invited African Americans to join—this at a time when such a thing was unthinkable in many towns. He introduced black athletes to sportswriters as his teammates and friends. Bill thought this was only right. After all, when he was recovering from a vicious bout of typhoid fever in Chicago, the Hebrew Institute had crossed ethnic lines to take him in, letting him use its gym, pool, and track to get back in shape. Bill liked to silence bigots with the tale of a young Jewish runner in St. Louis who gamely finished a marathon though his feet were bleeding, blistered, and swollen. “Don’t tell me that any one race has a monopoly on grit,” he wrote. We discovered that the Irish-American Athletic Club’s only criteria were athletic prowess and pluck. It didn’t restrict membership by race or ethnicity, instead welcoming blacks, Jews, Italians, Hispanics, and others who were excluded from high-toned outfits like the New York Athletic Club. During the 1904 Olympics in St. Louis, the IAAC “adopted” Cuban marathoner Felix Carvajal, initially an object of the crowd’s derision. Carvajal, finished fourth and was “the real hero of the race,” Bill wrote. It’s true that the communal exuberance that marked the early days of America’s entry into World War I devolved into a shameful hysteria in many quarters. This took forms ranging from the goofy, like renaming sauerkraut “Liberty cabbage,” to the deadly, like the aforementioned lynching. But it is not the case, I realized while researching Bill’s story, that earlier generations were uniformly, automatically more prejudiced than we are today. “Bricklayer Bill” wrapped his head in a homemade American flag on the day he won the Boston Marathon in 1917, but to him, and many others, those colors symbolized inclusion, not exclusion. Patrick L. Kennedy is a writer in Boston. He is the co-author, with Lawrence W. Kennedy, of Bricklayer Bill: The Untold Story of the Workingman’s Boston Marathon and the author of Boston Then and Now. Why Are Americans So Obsessed with Genealogy?